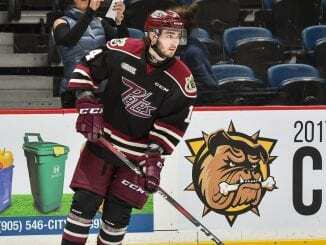 Peterborough Petes’ British forward Liam Kirk has won this week’s British Ice Hockey Player of the Week after claiming five goals in his team’s three games this week. 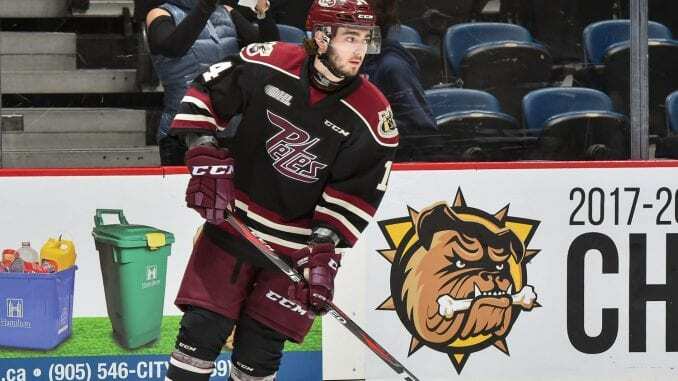 The teenager is aiming for the NHL, after being drafted with Arizona Coyotes, but is with OHL side Peterborough Petes as he works towards achieving his dream. 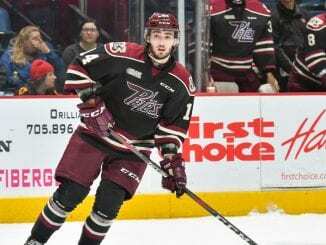 This week was huge for him as he scored five goals in his team’s three games, playing a part in each of Petes’ three wins. He picked up 56% of the votes, with Dundee Stars goalie Craig Holland on 21%, his nearest challenger in the Twitter poll. As he reflected on his tally, making it 10 points in his last 10 games, Kirk admits it’s been a period of adaptation, but things seems to be clicking for him now. “It’s been a really good weekend for us after a weekend where we had two bad losses so it was important to bounce back from that,” he said. Another four contenders are lined up for this week’s crown, with all four playing a part in their team’s successes this weekend. But who will you go for? “We went into the three games with the right attitude, determined to stick to the plan and we got the results from it. “It was nice for me to weigh in personally by getting the goals I did. In the past few weeks, I’ve started to feel a lot better. “Rob (Wilson) and Derrick (Walser) know about the league I’ve come from and my background, so they understand the type of hockey I’ve played so have been patient if I’ve struggled at times. Kirk’s great weekend started with a double in Thursday’s 8-2 shellacking of Kingston Frontenacs, swiftly followed by another two in Saturday’s 4-0 shutout win at Erie Otters. The fifth came just hours later in the 6-3 success over Hamilton Bulldogs, with Kirk getting the equalising goal on the powerplay on Sunday afternoon. It was a tough weekend, with three games in four days following a week with a three-in-three as the Petes had to be in top condition. Kirk admits it’s full on, something which is markedly different to life in the UK and he spoke of the support he’s got from back home, which he appreciates. He added: “It’s a tiring schedule and it’s all go, go, go so you have to recover well, eat well and sleep well and the main focal point after games is to recuperate. “It’s been a huge adjustment coming over here so it was tough the first couple of months. It affect my game a little, but things have started to click and it’s been a great few weeks. “I see a lot of support from fans back home on social media after games and it’s nice to see they’re still following my progress. “It’s especially nice to see Steelers jerseys in the crowd in some of the games I’ve played in. It’s quite surreal to think they’ll come all the way just to see me, but I really appreciate it.